The Outdoor Paintball Park is situated on the North-West side of Amsterdam and features 30 acres of paintball fields. The paintball park contains 12 different fields, each with their own theme and setting. You are offered an unique paintball and outdoor lasergame experience where visitors can enjoy a new game in a complete new environment. The players are guided by qualified personnel and will get clean camouflage suits and professional gear. There is no time limit to leave the fields, so you have unlimited playtime and groups will not be put together in fields. Paintball is the ideal activity for a company outing, family day, bachelor party or stag do in Amsterdam. It’s also possible to enjoy lunch or dinner on location. For lunch you can chose between a basic lunch or a lunchbuffet and for dinner you can choose between various barbeque menus. 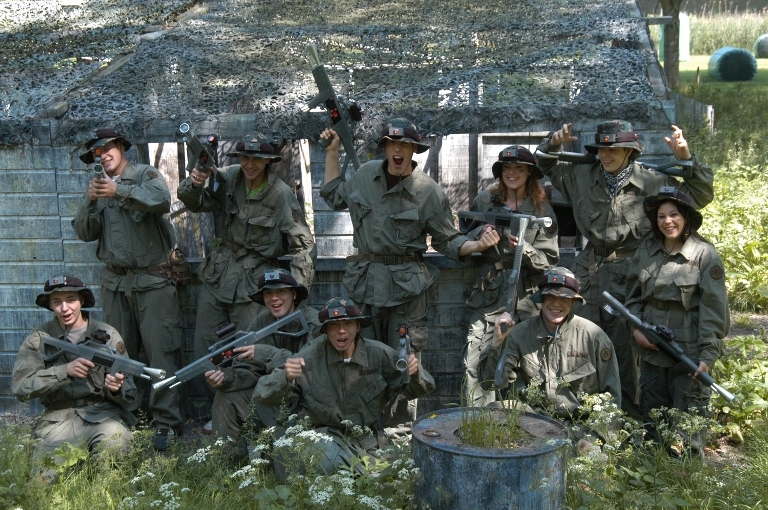 You have the possibility to enjoy an afternoon of paintball in Amsterdam from only € 32,50. Please Contact us for more information about customized lasergame arrangements. The basic package where you have a complete paintball arrangement for only € 32,50 per person. Isn't 100 balls enough? Then you can choose the BESTSELLER and play as a real Master Blaster with 300 paintballs for only € 42,50 (normal price: € 48,-). - you always have unlimited playing time, so you can stay as long as you want! - a battlepack for extra paintballs. Feel free to contact us when you have any questions or get a quote If you like outdoor paintball or lasergame. I had a great experience doing the super trooper package even though I am 76 years old. this is one in a life time experience and would recommend it to anyone that even sees this :) I hope you enjoy the after bruise as well as I did.